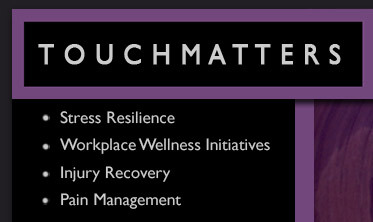 Touchmatters is a therapy practice offering a unique rehabilitative approach to injury, pain and stress resiliency. Individuals seek treatment for recurrent injuries, unresolved pain or to proactively combat the negative effects of stress in their lives. Combining extensive post graduate education and clinical experience I use a variety of therapeutic tools; Matrix Manual Therapy (MMT), Integrative Manual Therapy (IMT) and Massage Therapy to achieve the desired outcomes. In other words, your physical shape from the smallest of molecules to each of your cells and what’s in each of your cells to tissues to organs to structures to systems to the whole of you influences how each cell behaves biochemically. How each cell behaves biochemically will either support multiple levels of function and the experience of wellness you perceive at a conscious level or it will lead to distress, disease and/or death. A leader in research in the development of the Tensegrity Model, Donald Ingber M.D.,PhD demonstrated that each living cell in order to function as designed needed to be prestressed/preloaded. The term Biotensegrity was a term coined by Dr. Stephen Levin over 30 years ago in which the tensegrity principles were applied to biological structures such as muscles, bones, fascia, ligaments, tendon, cells, collagen. This tensegrity state of isolated compression elements and continuous tension, stabilized the shape of cells and the scaffolding/ skeleton-like structures inside the cells. This pre-stressed state poised the cell to receive signals in the form of mechanical forces transmitted from outside to inside the cell. In addition, on the surface of every cell tiny thread like structures called integrins connect to the connective tissue matrix outside of every cell. These threads sense and transmit the mechanical forces coming in from the matrix. The connective tissue matrix is composed of conducting material (collagen) in essence acting like a liquid conducting crystal. When mechanical forces are introduced into the body this generates a small electrical current known as the 'piezoelectric' effect which acts as a signaling system that informs the cells that are connected to the matrix. These mechanical forces entering the cell are converted into biochemical signals which is the function of each cell to perform biochemical work. Based on the tensegrity model the cell can be physically flexible to receive the mechanical load and then reclaim its ideal preloaded shape readying itself to receive another mechanical signal. MMT and IMT uniquely approach soft tissue pain and joint dysfunction. In both the assessment and treatment, MMT and IMT use specialized palpation skills and subtle soft tissue manipulations affecting areas of diminished connective tissue mobility and reduced circulatory flow. 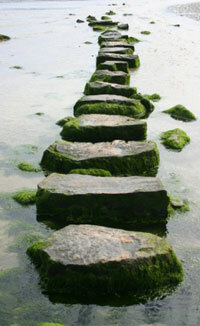 In this way the underlying causes of pain and disability are identified. Chronic or recurrent pain is an indication that the cause has not been addressed. All cells, tissues, organs, structures, systems and processes of your body operate in an interdependent relatable fashion. In other words everything is connected inside every cell and outside of every cell. The awareness and re-establishment of this relationship is at the heart of the Matrix Manual Therapy and Integrative Manual Therapy approach to pain and disability. The MMT and IMT approach to care recognizes your physical symptoms as an interruption in the signaling system be it bioelectrical and/or hydration of the cells, tissues, structures etc. and it is from this perspective that the assessment and treatment plan is developed. A review of the assessment findings with you. If you are a new client to this practice an assessment is required. To complete the assessment process 90 minutes is needed. When you book your appointment using the online booking process, click the ‘book now’ button and select "First Appointment". This level of care addresses the causes of a specific condition, injury or unresolved pain. The primary focus is to identify and treat the compromised structures, systems or processes that have created disruptions within the system. This level of care supports the healing process of mild traumatic brain injuries. By addressing the trauma forces, assisting in optimizing circulatory flow in the brain and spinal cord, some of the common symptoms often experienced with this type of injury can be lessened or eliminated. Sandra McCarthy, H.B.P.E., R.M.T., I.M.T.P., M.M.T. 134 Codrington Street, Barrie, ON L4M 1S1.